John marinated and cooked the shrimp and I prepared the condiments and beans. I got a mango and peach salsa which went really well with the shrimp and I also made a crema from non-fat yogurt, cumin, and salt. The soft tortillas are corn. The beans were spiced up with some fire roasted Rotel tomatoes and jalapeños and adorned with sliced green onions and cilantro. 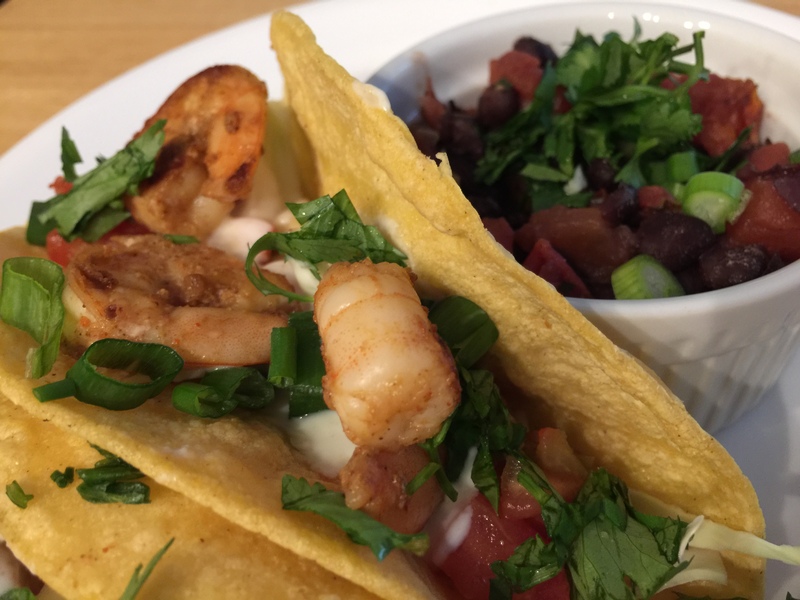 This entry was posted in Legumes, pescatarian, Shellfish, Vegetables and tagged black beans, cabbage, cilantro, corn tortillas, National Shrimp Day, Onions, Rotel, salsa, shrimp, Vegetables, yogurt. Bookmark the permalink.